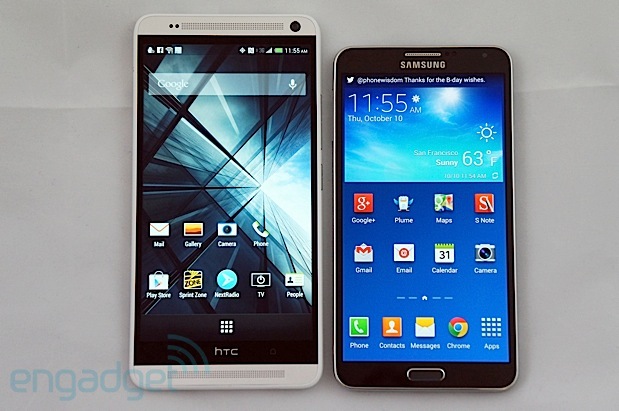 The debate around giant smartphones is over. Manufacturers like Samsung, Sony and LG have amply demonstrated that it's possible to build a pocketable, phone-like device with a screen bigger than five inches. 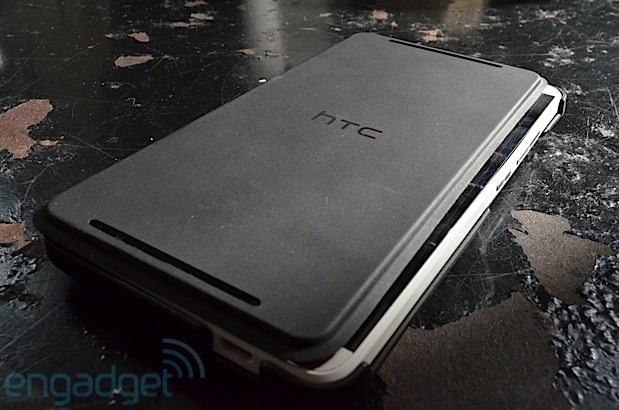 Now it's HTC's turn. But instead of re-imagining the much-praised One for this new category of device, HTC's designers have mostly just cloned it, while adding a drop of Miracle-Gro to produce a 1080p panel that measures 5.9 inches diagonally, versus the One's 4.7 inches. The result is the One Max, a product that carries over some good things from the One while also finding room for a few notable extras like a fingerprint scanner and expandable storage. At the same time, it also introduces some major snags -- not least of which are the its intimidating size and weight. The job ahead of us is to somehow find the upper body strength to weigh it all up. 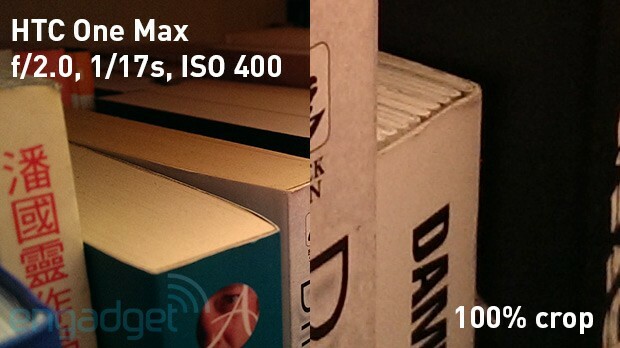 The One Max isn't much of an upgrade over the One and its features don't warrant the excessive volume or weight. Its screen, speakers and battery life are saving graces, however, and give it some credibility as a media player. How would you rate the One Max? We need to kick things off with an unfortunate disclaimer: The device we're looking at here was not final, but rather a very late-stage factory sample -- one of the first units off the assembly line. 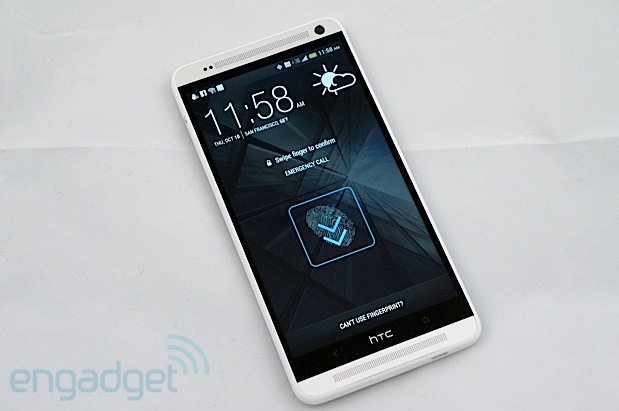 HTC gave it to us on the premise that it was worthy of being reviewed, so we expected it to be virtually immaculate. It didn't quite turn out that way. Our sample unit is coming apart at the seams. The removable back cover doesn't fit properly; the power button often jams; there's a visible gap between the display and the bezel on the right-hand side, and the optional $90 Power Flip Case looks as if it was designed for some other phone, because its front flap fails to fully cover the One Max's enormous display. As a result, this review can't be considered final until we get a chance to play with an actual in-store device and post an update, which we hope to do when the One Max officially launches in the UK at the end of this week. 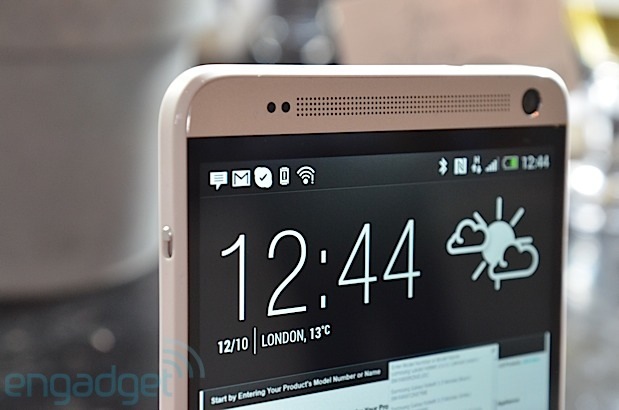 We're still waiting to hear from HTC on SIM-free pricing, but one retailer as it on sale at £600 ($952) in the UK. We've also been told that tariff pricing on Vodafone UK will come to £19 on the 3G £47 tariff or free on the £52 4G equivalent tariff -- making the One Max slightly more expensive than Sony's Z Ultra and barely any cheaper than Samsung's Galaxy Note 3. Even forgetting about the build quality issues and starting with a clean slate, it's hard to find much good to say about the HTC One Max's design. The One's singular, expertly crafted block of anodized aluminum has been replaced by an undignified white polycarbonate band that keeps the aluminum back and front sides of the phone joined together -- kind of like elastic holding up saggy underwear. The result is even less One-like than the One Mini, which also has a white band but wears it better due to the fact it has a neater, non-removable back. Perhaps this is why we feel a pang of guilt about the One Max's design woes. 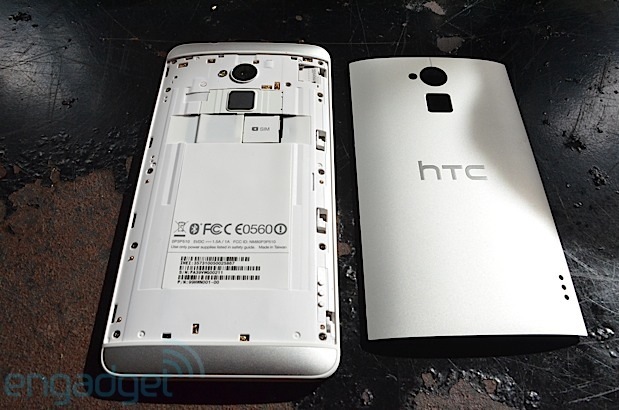 Having badgered HTC for the past two years to include microSD expansion, the company has finally given us what we want -- and this loss of build quality comes as a direct result. We refuse to take all the blame, however, since Sony has managed to deliver microSD slots in its latest phones without having a removable back cover. 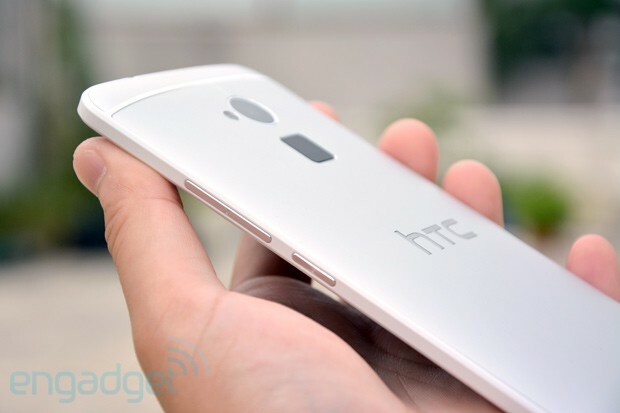 We wish HTC had managed something similar here. And then there's the issue of size. Samsung's Note 3 (151.2 x 79.2 x 8.3mm) and Sony's Xperia Z Ultra (179.4 x 92.2 x 6.5mm) offset their big screens with tiny waistlines or bezels, but the One Max makes no such effort: its front-facing BoomSound speakers sit loud and proud along the top and bottom of the display, bringing the length to 164mm (around 6.5 inches). The curved back panel, so elegant as part of the smaller One, brings the thickness to 10.3mm along its spine, which feels every bit as thick as it sounds. Turning the handset around, we see a set of pogo pins (which you use to attach the power case), the f/2.0 lens belonging to the 4MP "UltraPixel" camera, the flash module and, just underneath, the square-shaped fingerprint scanner -- which deserves a few paragraphs all its own. You can detach the spring-loaded back cover with a tiny lever on the side of the phone, and upon doing so, you'll have access to the aforementioned microSD slot and a micro-SIM slot as well. The battery is non-removable, since the Max takes advantage of the same pyramid-style component design we've enjoyed on the One, Butterfly series and Windows Phone 8X. Finally, like most large smartphones, it doesn't come with a stylus in the box, but HTC will offer one outside Europe and the US. Don't worry, you're not missing much here. It's just one of those typical capacitive pens that lack pressure sensitivity, and bizarrely, it doesn't work on several other phones -- not even the One. So, this scanner works. Just about. You have to be really careful to swipe your fingers in a "natural" manner and direction during the software's training process (the scanner asks you to swipe each finger four times) -- in other words, not the way it's shown in the instructions. After a few days of practice, we got the process down to a couple of seconds and we achieved a hit rate of 80 to 90 percent -- not enough to remove the occasional time-wasting failure, which sends you to a password login screen. A big part of the frustration is that you can't really see or feel the scanner to position your finger on it properly. If you change your grip on the phone, or if you put it in a case, you have to guess at a way to adjust your swipe to hit the scanner at exactly the right angle. Equally, it's not obvious how the thing works -- it doesn't technically "scan" an image of your fingerprint, but instead measures the capacitance of your skin to create a unique signature. HTC points out that this should minimize security fears, because it says it's impossible to create a law enforcement-style print from the capacitance signature, and much like the Touch ID component on the iPhone 5s, your fingers don't get stored in the cloud. HTC approaches its fingerprint reader in a unique way compared to Touch ID; you can store up to three fingers (or other parts of your body, we presume) and you can assign a quick launch shortcut to each individual digit. Thus, you could swipe your thumb to open the camera, left index finger for messaging and perhaps your right pinky for Gmail. 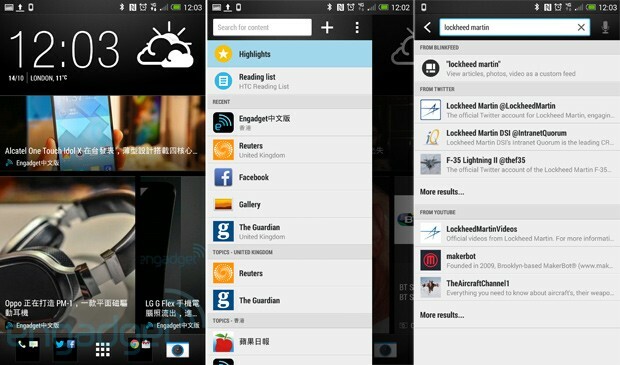 You can also choose to have your fingers simply open to the home screen, if that's all you need. This additional customization is a nice touch, though we'd like the Max to store even more fingers. At last, some good news. HTC's Super LCD 3 panel is still the best in its class, and the best on the whole market if, like us, you prefer the natural colors of an LCD display to the over-saturated appearance of an AMOLED panel. The Xperia Z Ultra's display, which is one of Sony's best efforts so far (and a very good panel in general), is left behind in terms of viewing angles, contrast and outdoor visibility, if not color accuracy. Paired with the BoomSound speakers, which we believe to be feedback-equipped NXP circuits inside expanded speaker boxes, the HTC One Max delivers a perfect video-watching experience. Nothing comes close except perhaps the One, which also offers great entertainment despite the smaller screen. Headphone output from the One Max is nice and vibrant, and it doesn't lack volume even with relatively high-impedance cans. Fortunately the whole Beats gimmick has disappeared, this being HTC's first release since it announced that it's parting ways with Dr. Dre and his outfit. If you want a certain equalizer setting, which is effectively all Beats ever provided, there are numerous apps that facilitate it -- even Spotify now offers EQ options. Finally, a quick but important caveat: before you invest in the $90 Power Flip cover, make sure it will accept your headphones. The wide 3.5mm plug on our AKG K551s wouldn't push all the way in, rendering them unusable. 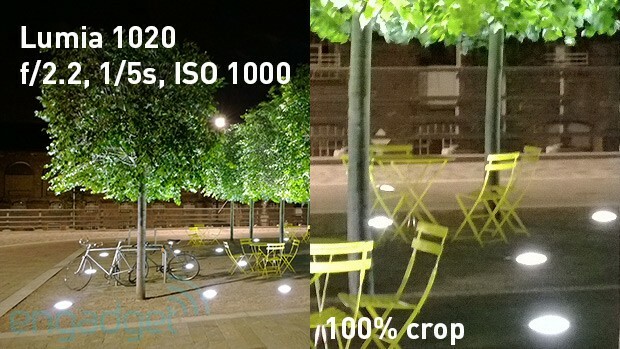 If you haven't already heard about HTC's "UltraPixel" technology, the rudiments of it are simple: by crowding fewer pixels onto the sensor, it's possible to get superior performance in low light -- but at the expense of high-res images that can be cropped and zoomed. The addition of an f/2.0 lens and some low-strength optical image stabilization in the original One gave it competitive imaging, albeit not in the same league as a camera-focused phone like the Xperia Z1 or Lumia 1020. With the One Max, HTC really should have improved the OIS to ensure its new phone stayed relevant. Instead, it removed OIS completely, leaving us with a predictable, middle-of-the-road UltraPixel camera that fails to stand out among the ever-improving competition. It's not bad at stills, especially if you're comparing it to another non-stabilized camera such as on an iPhone, but nor is it anything special. 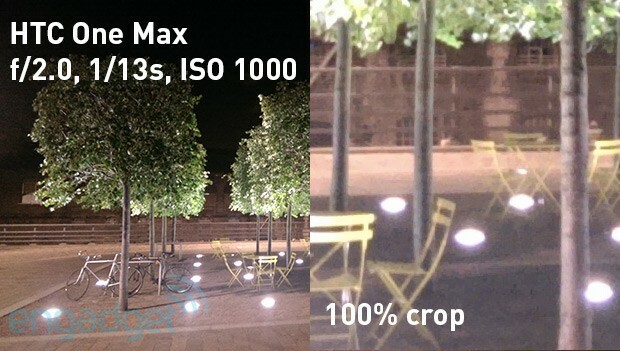 Comparing the low-light shot below with an equivalent image from the HTC One, there's barely any noticeable difference -- the HTC One's stabilization apparently didn't kick in to allow a longer shutter with reduced ISO and noise, so the One Max wasn't left at a disadvantage. 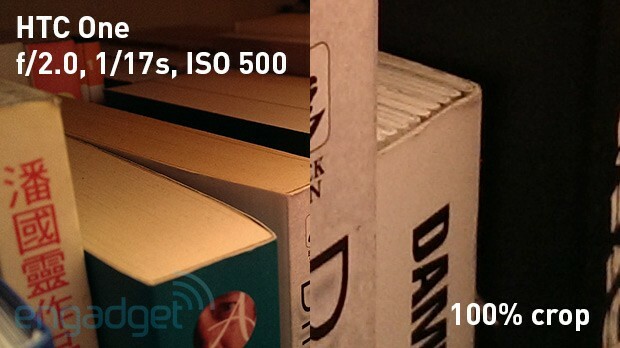 Next up, a quick comparison of a night-time shot, which shows how much further ahead the Lumia 1020 is in terms of camera technology. 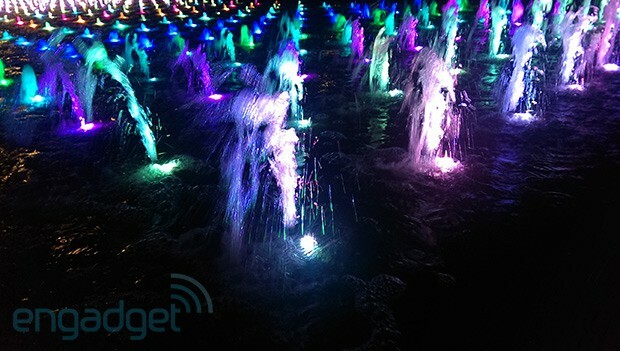 In this instance, the Lumia's advantage stems partly from its OIS, which allowed the shutter to stay open more than twice as long without introducing shake, but also from the impact of pixel blending, since the Lumia reduces noise by producing a 5MP still from a 41MP original -- something the Xperia Z1 can do too. As 20MP and even 40MP sensors become more common, the act of pinch-zooming into a photograph to reframe it or show someone a particular part of a scene will become more common, and that just isn't possible with a 4MP UltraPixel image. If HTC had found room to increase the sensor size and the resolution up to 6MP or 8MP, we'd be a lot more excited about it. 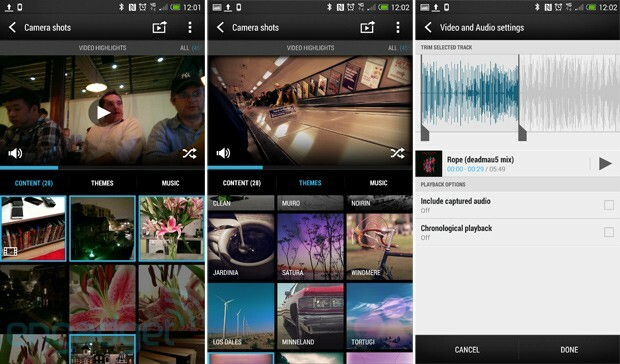 One strong point of HTC's offering is its camera app, which is extremely fast and intuitive to use. Snapping off a photo feels instantaneous, and holding the shutter button shoots up to ten full-res shots per second. That speed is also apparent with the smooth HDR capture and processing, which takes two exposures and overlays them. Finally, just as on the One mini, the Max also offers the option to lock exposure and focus. Video quality was bog-standard. The lack of OIS really hurts here, because it means that camera shake will consume a large and unfair portion of the available bit rate. This bit rate averages a healthy 2.7 MB/s (21.6 Mbps), so the resulting footage isn't awful, but you can see how it breaks down slightly in our sample video when we point it at the flowing water of the River Thames -- hand-shake coupled with the detail of the waves was too much for it. The quality of the audio recording isn't as good as on the original One, however, possibly due to the patent dispute with Nokia forcing a change of spec, and wind noise was noticeable in our recording. Finally, we wanted to test autofocus speed, but -- as you'll see from the clip -- a bug somehow prevented this from working while a video was being captured. Hopefully HTC will be able to fix this before the official launch. While the hardware alone will struggle to convince the masses, the One Max attempts to make up for it with its software, and we'd say it's a job almost well done. As the number suggests, Sense 5.5 -- based on Android 4.3 -- is essentially a beefed-up version of the UI that helped popularize the One, packing some new features as well as significant enhancements. The most obvious change is that the home screen now offers an extra line of icons both vertically and horizontally, but that's as far as it goes in terms of making use of the larger display -- there's no particular feature that enhances single-hand usage, nor is there a multi-window mode to allow true multitasking. Compared to the likes of the Vivo Xplay, Sony Xperia Z Ultra, Samsung Galaxy Note 3 and Oppo N1, we feel that with the One Max -- which is heavier than the aforementioned devices -- HTC missed a big opportunity to make its large form factor more usable or unique. On the bright side, Sense 5.5 on the One Max gives us a sneak peek at what to expect when the One and One mini receive software updates of their own. One of the handier features is the "Do not disturb" mode, which can be toggled from the pull-down shortcuts tray to block calls and mute notifications (you can also add contacts to an exceptions list). BlinkFeed, a feature that's either loved or loathed by users, aims to please a wider audience by supporting RSS feeds (the XML links of which can be added from browsers), as well as Google+, keyword-based custom topics, multiple regions in the same feed, read later and offline reading. But if you insist, you can now simply turn off BlinkFeed with the top-left button on the home screen editor page (pinch anywhere on a home screen to toggle). Folks who are familiar with Sense 5 will need to get used to the new video highlights editor in Sense 5.5, but once you get the hang of it, it'll become your new time-waster. On top of the new interface that lets you preview the assembled clips without going full screen, there's now a new theme engine that can time its video transitions according to the beat of either the default theme music or your own music tracks. As a bonus, your video highlights can now go beyond the old 30-second limit if you use your own music, plus there's also an option to sort the clips in chronological order, something we needed badly in Sense 5. With these enhancements, we indulged ourselves in spending more time playing with different combinations for our video highlights. Last but not least, you'll find several familiar apps bundled with Sense 5.5, including SenseTV to go with the One Max's infrared blaster, the self-explanatory Kid Mode, the driver-friendly Car app UI, Stocks and Polaris Office 5. What used to be Notes is now Scribble, which has lost sync capability with Evernote (apparently users prefer using Evernote's own app, anyway), but gained some themes and drawing effects. Very little has changed in the processor department since the advent of the One, which means the One Max is very much a mid-cycle addition to the family rather than a new flagship. It sticks with the tried-and-true Snapdragon 600, which mostly retreats into the background and only very rarely provides any cause for complaint. Compared to Snapdragon 800 devices like the LG G2, Xperia Z Ultra or Galaxy Note 3, the primary difference is in the load times for games and other big applications. Even on a relatively simple game like Wordament, the One Max's load time was at least a couple of seconds longer than that on a Snapdragon 800 phone. 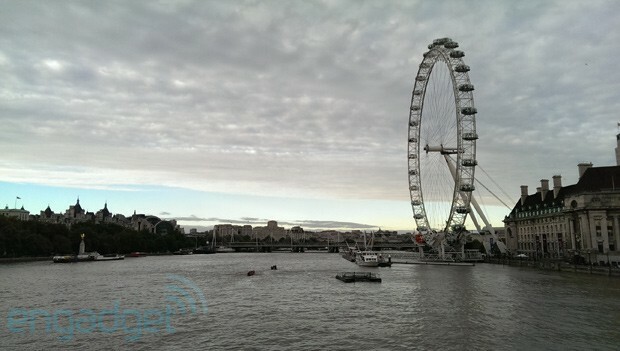 Call quality and stability was fine on both EE and Vodafone networks in London. Reception strength was, if anything, slightly better than on some other devices. The One Max was able to get a reliable bar off EE LTE even in spots where our Xperia Z1 was occasionally forced to revert to HSPA+. And even with this single bar of reception, we managed 17Mbps down and 5Mbps up, which is pretty good. On Vodafone's HSPA+ network, we got 4.3Mbps down and 1.1Mbps up with a couple of bars of reception, which is on a par with other phones containing the same SIM in the same location. As for battery life, we have something to celebrate: on an HSPA+ network, the 3,300mAh battery easily gave us enough juice for a day of heavy use. After 10.5 hours of calls, camerawork, gaming and lots of WiFi downloads, we still had 27 percent remaining. On a day of light use, with just a few calls and a bit of gaming, and with no charging overnight, the phone still had 14 percent of battery after 40 hours of use. This was partly helped by the default Power Saver setting kicking in when the battery indicator turns yellow -- this feature clocks down the CPU, reduces screen brightness, turns off vibration feedback and turns off the data connection while the screen is off. Add the 1,200mAh battery cover (shown above) and you should easily make it through two days without issue, provided you can stand lugging the thing around for that long. Update: The HTC One Max survived 12 hours and 20 minutes on our rundown test while hooked up to EE's LTE network. That's around 30 percent longer than the Note 3. Big though it may be, the One Max is still overshadowed by our expectations. It should have taken things further than the One, but instead it merely attempts to cash in on the One's reputation by allowing HTC to claim that it has a "family" of One devices -- devices that in reality have little in common with each other beyond their superficial appearance. The One Max should have had a better, optically stabilized camera; it should have future-proofed itself with a Snapdragon 800 processor; and it should have been physically more manageable -- perhaps with a 5.5-inch touchscreen to compensate for the size of the BoomSound speakers, and definitely with a thickness of less than 10mm. Why did none of this happen? Well, we actually put these questions to HTC -- one of the most open and friendliest manufacturers in this business -- and on some points it simply didn't have an answer. On other points, the implicit answer seemed to be that the One Max is a mid-term addition rather than a new flagship, perhaps primarily designed to cater for an Asian niche, and so it was never going to be the target of big investment. By contrast, the phone does require a big investment from the customer, given its premium price, so we can't recommend it over the Note 3 or the Z Ultra. Then again, if the build quality issues we experienced get fixed in the retail unit, and if HTC can somehow improve the design of its Power Flip Case, the One Max should still attract a few buyers. It will especially appeal to someone, such as a frequent flyer, who wants a big screen and big battery specifically for the purpose of consuming video and music, at the expense of other requirements. If that's you, and if you can find the One Max for a decent price, it's worth taking a look. Richard Lai and Brad Molen contributed to this review.